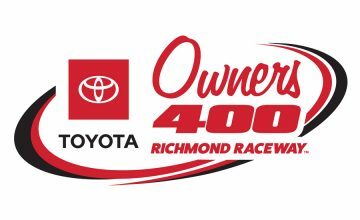 RICHMOND, VA — Twenty-three-year-old, Christopher Bell won the ToyotaCares250 Friday night over teammate, Noah Gragson, and shut Elliott Sadler out of an elusive victory at his home track. Over the course of 250 laps, Bell led three times for 120 laps, five laps shy of half of the race, and the most of any driver. Gragson, who made his NASCAR Xfinity Series debut, finished second. Not only that, but he ended the race haunting Bell around lapped cars. With a little more than half a dozen laps left, Gragson was up to Bell’s bumper in the corners. From there, he wasn’t able to get the job done, but the first time NXS driver impressed everyone at Richmond Raceway when he finished just 4 tenths of a second behind the winner. If he were a NXS regular he would have earned himself a chance for the Dash-4-Cash bonus in next week’s race at Talladega. 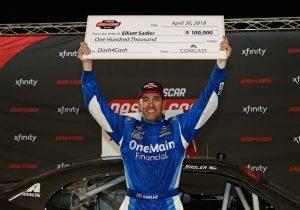 Tonight, the 100k Dash-4-Cash prize was won by Elliott Sadler. Though Sadler wound up third, he was the highest finishing of the drivers in contention. “To not win the race is bad,” said Elliott, “but to win 100k is great, my wife has probably already spent it. … We always want to win at this race track and it’s a shame to come up short tonight. 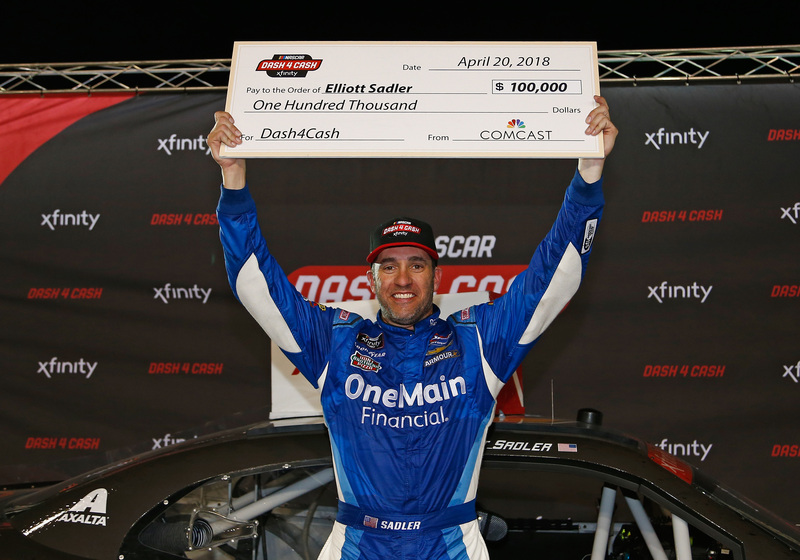 The sentimental value is worth 100k, because Sadler says he’d give up his Dash-4-Cash bonus to have the win. Daniel Hemric, Tyler Reddick, and Spencer Gallagher were his three opponents for the prize, but none of them finished closer than seven positions to the 43-year-old, Emporia, Va born driver. Reddick finished 11, Gallagher 17, and Hemric was 29 after suffering a blown right front tire shortly before the conclusion of stage-two. The four highest finishing NXS drivers Bell, Sadler, Matt Tift, and Austin Cindric are the eligible drivers at the next race. 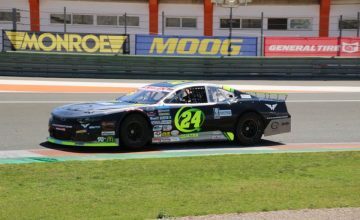 Even though Cindric is a rookie and was making his first start at the track he wound up with a fifth place finish, his first top-five in the series. “We were a top-three car, we just needed a Cup race worth of distance to get there,” said Cindric after the race. Pole-sitter, Cole Custer led off the bat, when the race started, and Bell stayed with him, but by the time of the first caution – lap 20 for a stopped vehicle – Custer had opened up a one second lead. On the restart Custer continued to hold point, but the 2017 NASCAR Camping World Truck Series champion made a pass on the second year Stewart-Hass Racing driver on lap 44. At one point during the first stage a Dash-4-Cash contender tangled coming off turn two — Hemric slid into Justin Allgaier. The No. 7 was sandwiched between Hemric and the outside wall, giving Allgaier the most damage in the incident. He immediately began pushing up the track in the turns. Without a dialed in car, Allgaier did his best to muster a 14 place finish. “(Hemric) took me to the fence on purpose, and it’s killed,” said Allgaier over his team radio shortly after the tangle. With 12 laps left in the first 75 lap stage, the yellow flag was waved for Josh Bilicki’s scrubbing of the retaining wall. The front runners stayed on the track under the caution period, coming to the restart Bell chose the outside lane. As Bell went to the gas his tires spun; Hemric, who had steadily moved through the top-five, didn’t relent — beating him to the start/finish line. NASCAR officials didn’t penalize Hemric for beating the leader the line because he didn’t go until Bell made his move. Two cautions slowed the first stage but no such thing occurred during the second. John Hunter Nemeckek picked up the lead after the leaders pitted for fresh tires and fuel — he had pitted under the lap 64 caution. Nemechek didn’t go by the wayside when the race restarted, he held his own. He led a gaggle of drivers, including Elliott Sadler, Bell, and Noah Gragson, until Bell went back to the lead on lap 116. Though his car is stable, Sadler drifted wide on the restart that began the final stage. Gragson, who restarted in the outside lane, inserted his No. 18 Joe Gibbs Racing Camry into the middle of a three-wide battle for the lead. In his NXS debut, Gragson made a three-wide pass for the lead. On lap 166 a five car wreck erupted on the front stretch. Ryan Reed drifted in front of Gallagher, forcing him to check-up. By way of chain reaction, Chase Briscoe and Michael Annett wrecked across the start/finish line. The pair of drivers didn’t have their nights ended by the wreck, but their cars were never the same, Briscoe finished 26th and Annett finished 20th. The Toyota Care 250 went green for the final 80 laps of racing. Gragson was the leader until lap 172, when Bell went back around the young Las Vegas native. It was a tire game from that point on, drivers knew whoever saved the most would have the best opportunity to drive up to the front. With 18 laps to go Gragson told his team he couldn’t be patient any longer, ten laps later Gragson was on Bell’s back bumper, but that was all he had in him. Over the course of the final half-dozen laps Bell pulled ahead for a 0.423 second victory over his teammate.